imagesMy hands are wings; they let me fly....Art has been a part of my life for as long as I can remember. Watercolor and collage are my mediums of choice. I like to work intuitively and freely, allowing my work to evolve. The images are the result of open-ended flexibility. Color and texture are important considerations that result in a vibrant and contemporary style. 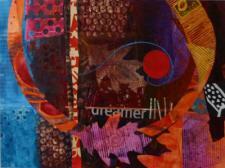 The resulting work is an exclamation and an exploration.I am passionate about collage. I find every aspect of it appealing. There is rummaging and collecting; just looking for and finding things to use in the process is like a wonderful scavenger hunt. There is a feel to collage: papers of different weights, surface qualities and textures. Feathers, bottle caps and stones offer their own delights. Collage is full of play for me.Being an artist is a journey and a gift. My heart is joyful and spills out into my work. Art is my prayer of gratitude. 2007: Doshi Exhibit@ Susquehanna Art Museum: "Where I End and You Begin"
2005: Doshi Exhibit @ Whitaker Center of Arts and Science: "To the Edge of the World"